In this paper, a closed-form approach is presented to estimate rapidly the equivalent stiffness of boards used in cross laminated timber (CLT) panels from local orthotropic behavior at ring scale for varying sawing patterns. It is first assumed that narrow edges are glued. In this case, closed-form Reuss and Voigt bounds are derived for the equivalent layer behavior of CLT. 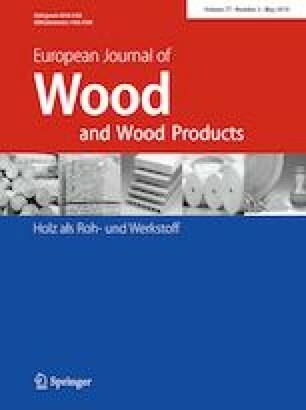 An application to Norway spruce boards is presented and reveals that the cross-layer (rolling) shear behavior lies between 100 and 150 MPa with a careful selection of the board sawing pattern. Then, using finite element method, upper bounds for the cross-layer shear stiffness modulus of boards with and without glued edges are calculated and theoretical predictions are compared with recommendations and experimental data from the literature. Finally, it appears that these bounds remain relevant for CLT layer with unglued narrow edges for common aspect ratios.